A group of vets who underwent a study on assessing pain in ridden horses say they will change their procedures for both pre-purchase examinations and equine performance assessment in the future. 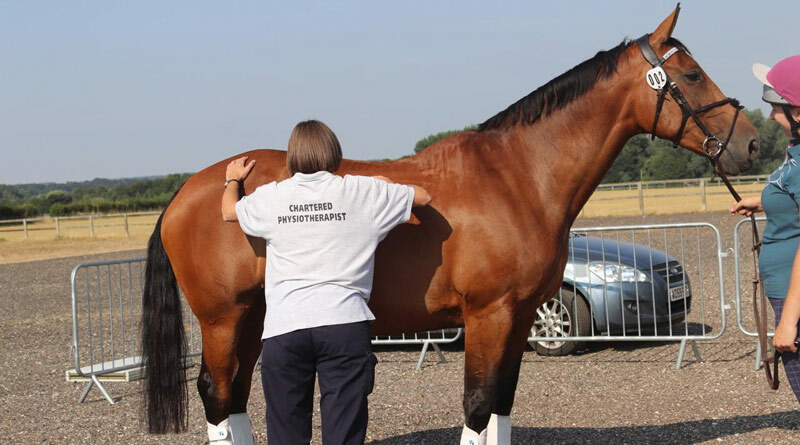 Led by Dr Sue Dyson, Head of Clinical Orthopaedics at the Centre for Equine Studies at the Animal Health Trust in Newmarket, the study assessed how accurately vets may be able to use an inventory of behaviours — an ethogram — developed by Dyson, to assess pain in ridden horses. The ethogram defines 24 ridden behaviours that may reflect pain and lameness. The study was conducted at World Horse Welfare’s centre in Norfolk in July. Twenty horse and rider combinations, together with a range of professional practitioners, volunteered their time to support the study, which has the potential to transform the welfare of ridden horses. Initially the horses were assessed by Association of Chartered Physiotherapists in Animal Therapy (ACPAT) physiotherapist Jo Spear. The back was examined to check for any areas of muscle tightness or discomfort. Society of Master Saddlers (SMS) Saddle Fitter, Liz Suddaby, checked the fit, placement, balance and suitability of each horse’s saddle. The horses were then given a 15-minute ridden warm-up before executing an 8-minute purpose-designed dressage test. Three lame horses. (A) Tail swishing; mouth open exposing teeth and upper gum; teeth separated. Right nostril flared and angular with wrinkle below it. Intense stare; tension in muscles dorsal and caudal to right eye. Left ear forward and right ear back. Front of head vertical; right bit ring snug to cheek. (B) Tail swishing; spooking. Lips separated exposing teeth. Right nostril flared; wrinkle between nostrils. Right eye wide open, with tension in muscles dorsal to eye. Ears forward. (C) Resisting, unwilling to go forward, with a small rear with both forelimbs off the ground. Lips separated exposing teeth and tongue. Angular flared right nostril with wrinkle below and between nostrils. Intense stare; tension in muscles dorsal and caudal to eye. Ears erect with pinnae rotated outward. No tension in right rein. During the dressage test a team of 10 equine vets, selected from 40 volunteers, scored each horse for the presence of 24 behaviours that may reflect pain. The tests were filmed so that Dyson could make a comparison between her own real-time behaviour assessments and video analysis and so that the rider skill level could be scored retrospectively by Dr Anne Bondi BHSI. The ten equine vets, four men and six women, who varied in their years of experience, collectively said that it was one of the best days of continual professional development that they had ever had and that they would change their procedures for both pre-purchase examinations and investigations of either lameness or poor performance in the future. “This system is such a useful tool; most of the factors we were scoring were not a surprise, but by being able to quantify the pain in a way that a client can understand and relate to is priceless,” said Helen Whitbread of Deben Valley Equine Veterinary Clinic. Dyson continued: “The behavioural differences between the lame and non-lame horses in the study were very apparent. I am currently cross-referencing analysis of the volunteers’ results with me as the Gold Standard. Early indications show that by giving vets a clear understanding of pain associated behaviour markers they will be better able to recognise pain-related behaviour in ridden horses, which may reflect lameness, and to communicate potential performance problems more effectively with their clients. An overview of the study will be presented at the Saddle Research Trust Conference in December. For tickets or more information on the conference, call 07948 303281.